Bave started out drawing for WHAM!, to which he contributed ‘Sammy Shrink’, ‘Baby Whamster’, ‘Baby Smasher’, and ‘Grimly Feendish’. 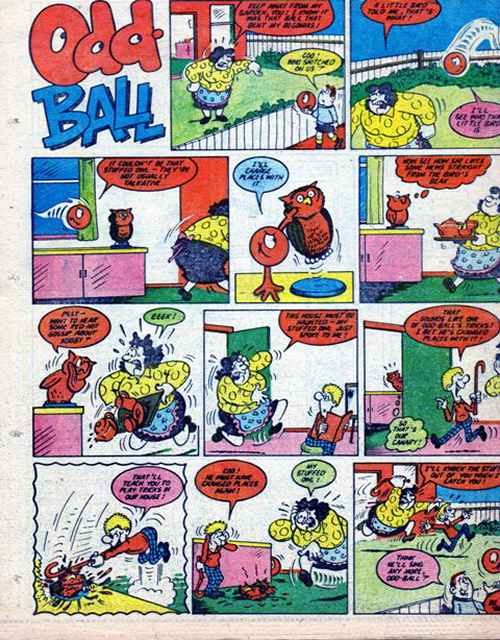 He moved over to Fleetway Publications in 1969, and Bave became a regular in Whizzer and Chips. He was the prime artist of the weekly ‘Odd Ball’ comic, that started in 1969 and ran until 2000. During the 1970s and 1980s, Bave worked many other IPC/Fleetway magazines, like Shiver & Shake (‘The Desert Fox’), Krazy (‘Scaredy Cat’), Cor!! (‘The Slimms’), Cheeky/Whoopee (‘Webster’, ‘Toy Boy’, ‘Calculator Kid’, ‘Blabbermouth’, ‘Willy Worry’), WOW! (‘Barney’s Badges’), Jackpot (‘Richie Wraggs’, ‘Full O’Beans’) and Buster (‘Draculass’, ‘Pete’s Pop-Up Book’, ‘Good Guy’). He has mainly done his scriptwork in cooperation with his wife, Sheila. In 2013, Terry Bave published a book called ‘Cartoons and Comic Strips’, with over three hundred pages of reminiscences, artwork and original cartoons.